Websites affiliated with former President Mahmoud Ahmadinejad were blocked in Iran and the country's most widely used state-approved video-sharing site barred users from accessing Ahmadinejad-related content after the politician criticized state officials in a recent speech. The Center for Human Rights in Iran (CHRI) has also learned that Parsijoo, a domestically created Iranian search engine, is redirecting users searching for the word "Ahmadinejad" to state-sponsored websites providing false information. Ahmadinejad was censored from the internet in Iran after he delivered a speech at the Shah Abdol Azim Mosque in southern Tehran criticizing state officials. 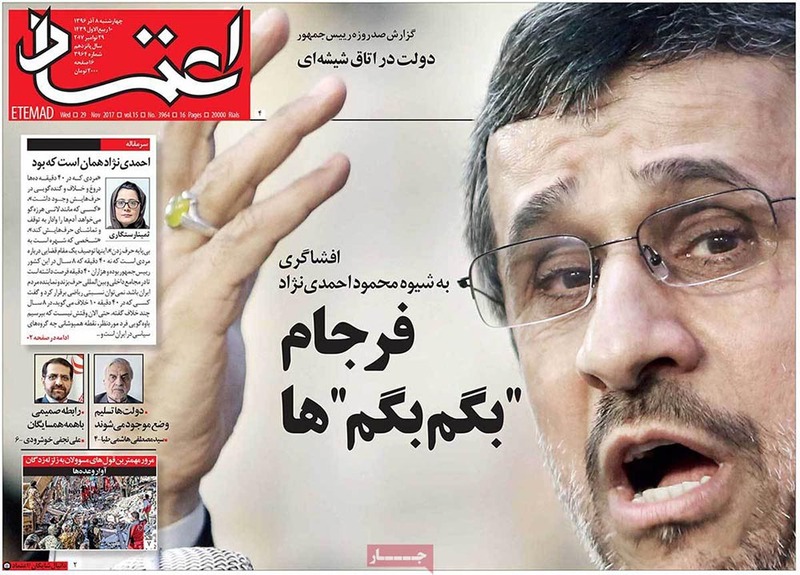 "I swear to God and the Prophet that we are against the Larijani family," said Ahmadinejad, referring to Chief Justice Sadegh Larijani and his brother Parliament Speaker Ali Larijani. "Is opposition a crime?" he asked. "We don't want the country to fall into their hands. As soon as we criticize them, they say you were insulting and press new charges." Since the speech, a Farsi-language search for "Ahmadinejad protest" on Parsijoo results in one inaccessible link. A search for "Ahmadinejad in Abdol Azim" on Parsijoo's video section results in eight links with videos that display an error message when the user attempts to play them. 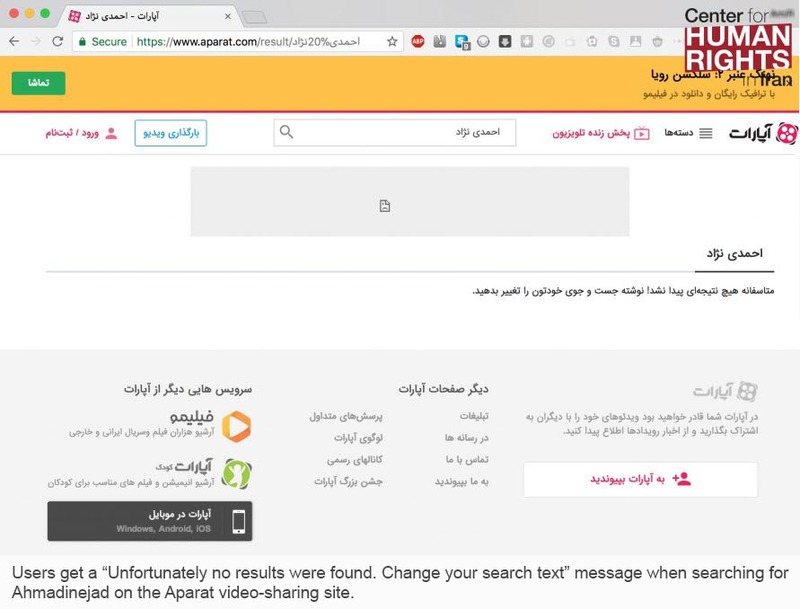 Since November 27, 2017, searches for the word "Ahmadinejad" on the Aparat video-sharing site have resulted in a blank page with the message, "Unfortunately no results were found. Change your search text." Privately owned, Aparat is favored by the state for complying with Iran's strict censorship policies and is thus able to offer users faster download speeds on Iran's state-created domestic internet, the National Information Network (NIN). Due to the state ban on YouTube, many Iranians have turned to Aparat as their main video-sharing website. They also get a discount on their internet bill when opting to use the site over non-state-approved sites. Ahmadinejad fell out of favor with Iran's ruling elite during his second term in office (2009-13) for promoting his own version of Iranian nationalism and publicly criticizing powerful politicians. Earlier this year, the Guardian Council, which vets all candidates in elections, disqualified him from running for the presidency in May 2017. Since Ahmadinejad's recent speech, a website featuring news about the former president, Dolat-e Bahar, has been blocked in Iran. Its editor-in-chief, Mohammad Hassan Heydari, was arrested on November 21. A few days earlier, the Aria News Agency site, also affiliated with Ahmadinejad, was shut down on November 17 for posting and sharing statements by him and his top advisers. In addition, Mobogram, an Iranian-made app attempting to mimic the popular Telegram messaging network, went offline soon after users began sharing news and images related to Ahmadinejad's speech.